I LOVE SOUP! I think soup is the perfect meal for lunch, well really anytime but especially during the cold months when you need just a little hug of warm soup in the middle of the day. Last week I made Lentil Stew (recipe is on the blog) but this week I went for Vegetable Minestrone. I appreciate the protein coming from the white beans (that I made instead of buying canned… I swear their easy) and the abundance of vegetables, also bean and veggie soups are good to your waistline, at this time of year that’s a blessing in my book. Enjoy! 1. Start by heating some olive oil in a big soup pot over medium heat, when you can smell the oil add the onions and start to saute. Saute for just a few minutes and add the carrots, celery and garlic. Saute for just another few minutes (maybe 5 minutes). Season with salt and pepper. 2. Next add the zucchini and season well with salt and pepper, toss around and saute until the zucchini starts to soften just a bit, maybe another 5 minutes. Next add the tomatoes, broth, beans and rind if using, bring this mixture to a boil and reduce back to medium heat. Simmer for 20 minutes. 3. The last 5 minutes add the kale and cabbage, stir in until it starts to wilt, add the water and top with the lid and let simmer for those last few minutes. Remove the lid and taste for salt and pepper- add more if needed. 4. Serve hot with a drizzle of olive oil, grated cheese and a slice of bread, or divide into lunch containers for the week. 2. I sauteed some bacon in the soup pot before I started making the soup. 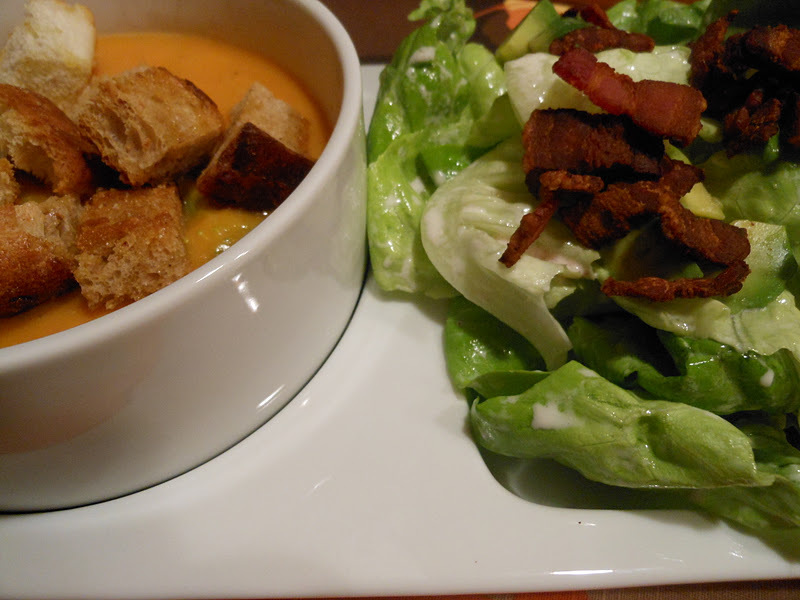 I scooped out the cooked bacon and about 2 T. of the bacon oil for my salad dressing. I left the rest of the bacon oil to saute the vegetables for the soup. 1. Start with the dressing, whisk red wine vinegar into the reserved bacon oil, next add the veganaise and whisk again. Season to taste with salt and pepper. 2. Place the torn clean lettuce into a large mixing bowl, pour over half of the dressing and toss lightly. 3. Plate your greens and top with diced avocado and chopped crispy bacon, drizzle the rest of the dressing over the two salads. This photo says it all-EASY! Just a few other ingredients are missing but it is really this simple. 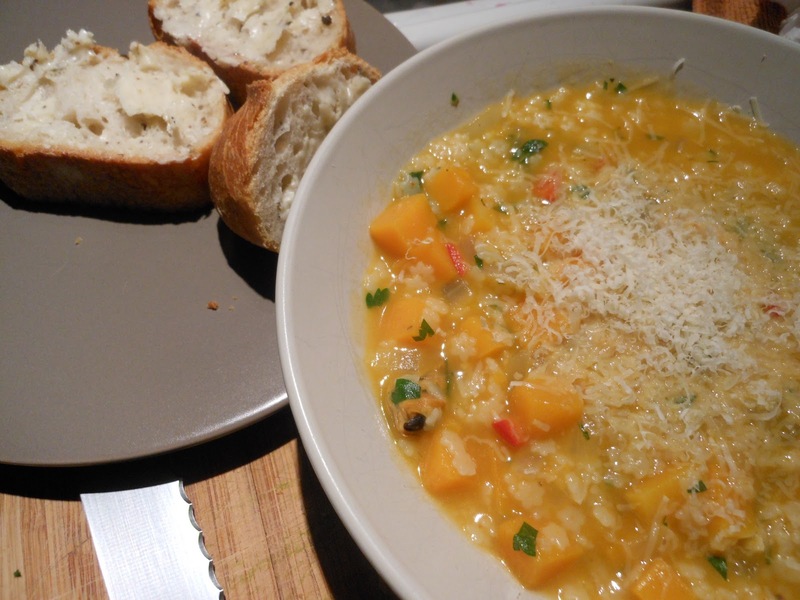 I had some leftover squash hanging out in the fridge and bought some at the Farmer’s Market, they all came together for this lushish, warm, grounding soup for my lunch this last week. Enjoy! 1. Start by heating your favorite soup pot over medium heat. Drizzle in some olive oil and add the onion, carrots and kombocha squash. Season with salt and pepper, stir and cover and with lid and cook for 15 min. Remove the lid, add the sage and saute for 5 minutes. 2. Add the pumpkin puree and baked sweet potato, stir to incorporate. Cook for a minute just to warm through. Season with a bit more salt and pepper. Next add the veggie broth and simmer the soup with the lid slighty askew for 15 minutes. 3. After you have simmered the soup, turn of the heat and blend the soup. (You can use a blender, food processor, or I like my hand held immersion blender). Last but not least add in the chipotle and orange juice and zest and stir to mix in. 4. Serve right away topped w/ toasted nuts and a drizzle of your favorite oil, or portion out in your lunch containers and store in the fridge for later. You can also freeze for a when your in a pinch. -If the soup is too thick just add a bit of water to loosen it up. Honestly this is on of the best recipes I’ve made in awhile, maybe because the first time I saw this recipe on David Rocco’s Dolce Vita show on the Cooking Channel I’ve been waiting for the best time to make it, well last night was the night and this recipe didn’t disappoint. Fresh, easy, seasonal and healthy- all the things this Cosmo Hippie Chef looks for. I served it with a crisp white table wine and slices of baguette topped with black truffle butter- totally gourmet and we didn’t have to leave the house. Maybe I should start charging Billy for dinner, Kidding! Enjoy! Cook’s Note: To clean fresh mussels, rinse under cold running water and rip off any beards. Discard any that do not close when tapped. Heat up 1/4 cup extra-virgin olive oil in a deep saucepan. Add the garlic and chopped chile pepper and cook for 1 minute. Add the mussels, wine, salt, pepper, and stir together. Cover with a lid, allowing the mussels to steam open. Cook until all the mussels are fully opened. Discard any unopened mussels. In another saucepan, heat up 1/4 cup olive oil. Add the onion, butternut squash, salt, and black pepper. Cook for a few minutes. Then add the pasta and mix together. Add the water and allow the mixture to cook for 15 minutes or until the squash is fork tender. 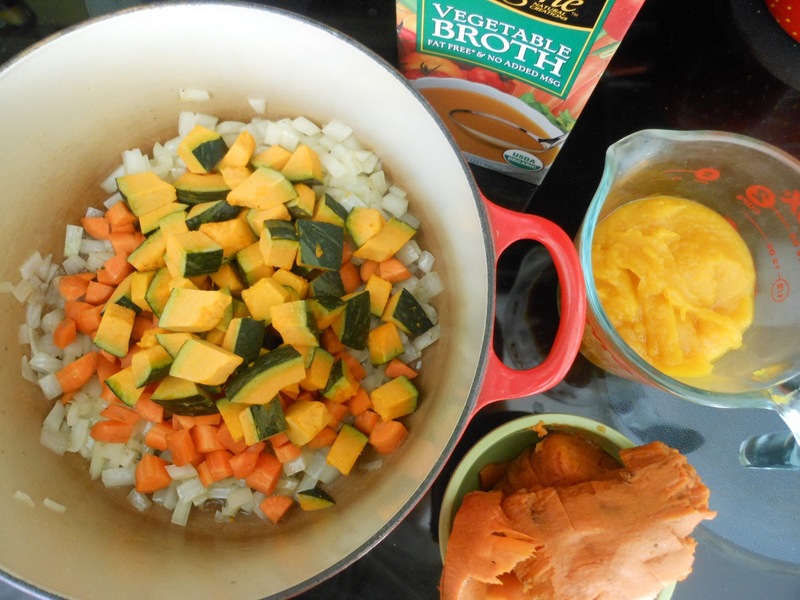 Cook’s Note: To give the soup a creamier consistency, mash 1/2 the squash with the back of a fork. While the butternut squash and pasta are cooking, shell the mussels and place them back into the saucepan. Transfer the mussel soup to the butternut squash soup. Mix together and add the Parmigiano cheese. Who wouldn’t want to eat this beautiful food for lunch?! I have really enjoyed my lunches the last couple days, especially today. I haven’t been sleeping well due to come serious back aches that have really been challenging. So even though I was tired and not wanting to put in the effort for lunch, I’m glad I did. -The Salad, mixed baby greens, diced carrots, diced snap peas, diced avocado, Sunbridge micro greens (local grower), broccoli sprouts and topped with Tempeh (it is a meat sub and it’s 19.5% protein, rich in unsaturated fats and highly alkalizing, strengthening and easy to digest) and of course dressed with Cilantro Miso Vinaigrette (on the blog). P.S. The bowl and plate my soup is in was given to me by my sweet grandma Little Polly. Still miss her terribly. Well yesterday was the perfect day to have soup and sandwich’s due do the fact that it snowed 5″ at our house, seriously! Saturday was warm and beautiful and great fish taco weather and them BAM, more snow. Any one who lives in Utah just knows that this is spring time weather but I know I speak for many of us when I say “enough already”. But- it’s great to make one of my favorite soups and cuddle up with Billy on the couch and do nothing. 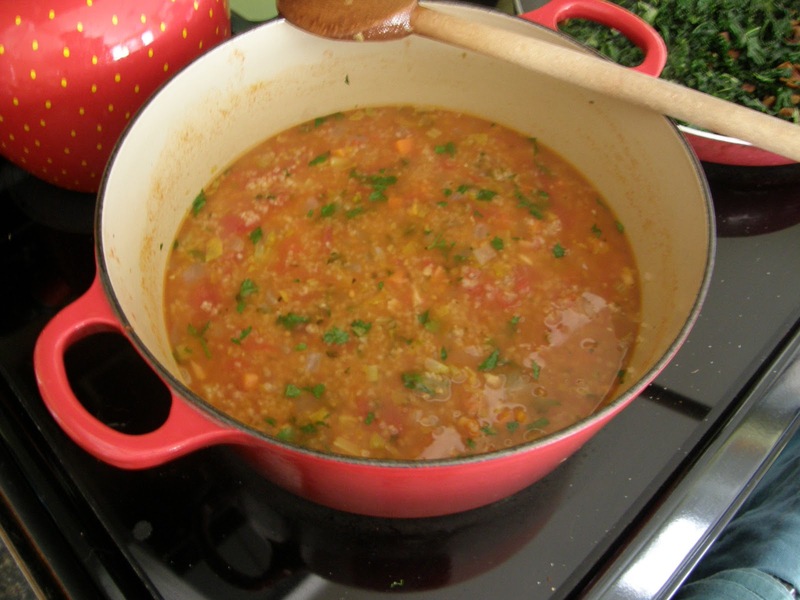 Now the weather looks crappy again this weekend so maybe there is time for you to whip up a batch of this yummy soup. Enjoy! 1. Preheat the oven to 400 degrees. 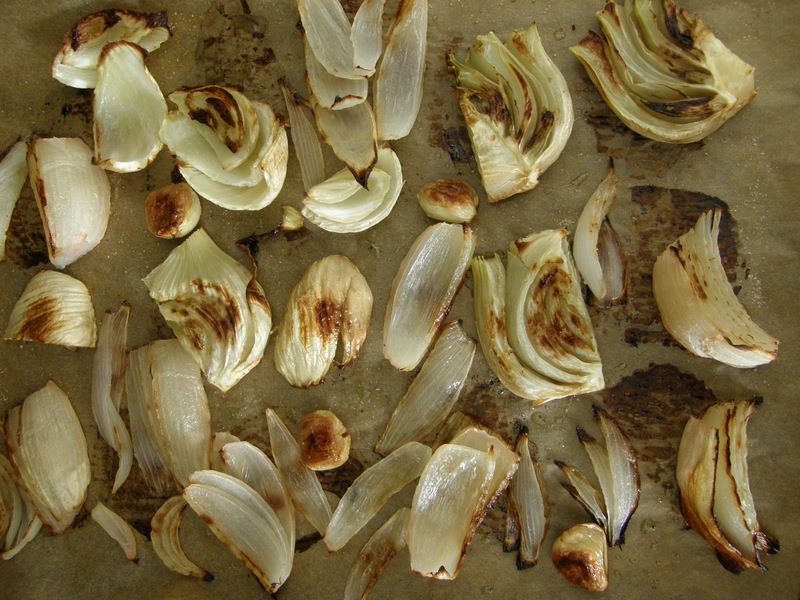 Place the chopped onion, fennel, and garlic on a cookie sheet lined with parchment paper, drizzle with oil and season with a little salt and pepper. When oven is ready place the vegetables in the oven and roast for 30 minutes, turn the vegetables over once during that time. 2. When vegetables are done pull out of oven and set to the side. 3. In a large pot or dutch oven heat the coconut oil over medium heat, when melted add the carrots and saute until a little browned on both sides. Add the roasted vegetables and toss around for just a minute. 4. Add the tomato puree, veggie stock and season with salt and pepper. Bring to a boil, then turn down to a simmer and simmer for 30 minutes with the lid askew. 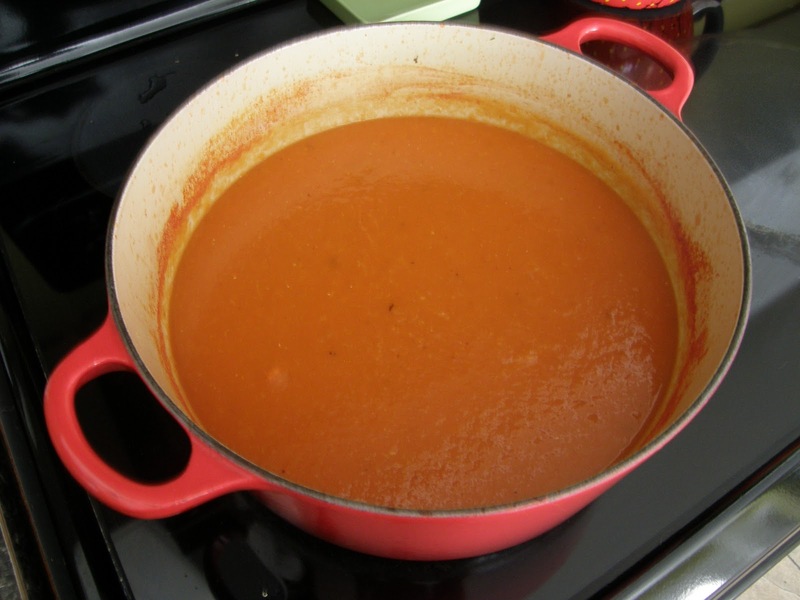 After those 30 minutes, puree the soup using a hand held blender or you can use your tradtional blender. 5. Taste for salt and pepper, and sevre hot. Yummy! 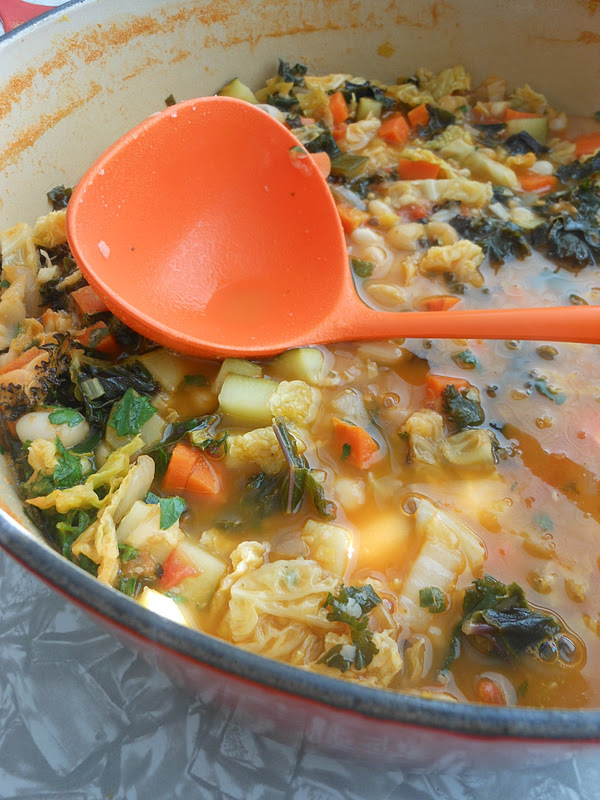 I made this soup at the beginning of the week and it was super easy and super delish! The blueprint for this recipe came from my Whole Foods App on my phone, I did add a few things of my own of course. Now listen it has been beautiful here (SLC) yesterday, today and hopefully tomorrow but then Sunday more rain and chilly. No big deal make a pot of this soup and some tuna sandwiches and it will be a great day. 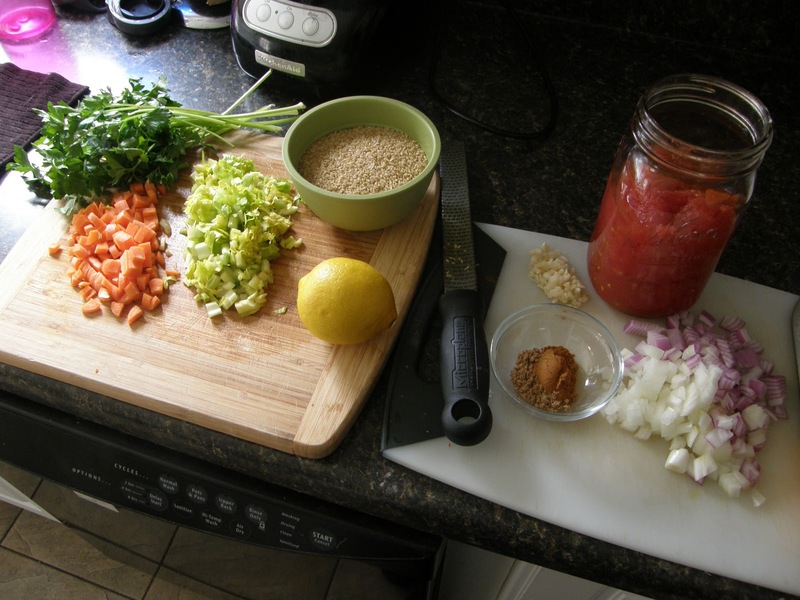 I think when I make this soup again on Sunday I am going to use Quinoa instead of the Bulgar. I’ll be sure to update y’all on which one is better. Good luck and Enjoy! 1. In a large pot or dutch oven warm the coconut oil over medium heat, when it starts to sizzle just a bit add the onions and start to saute. After about 2 min add the carrots, cook for another 2 min then add the celery and garlic and saute all together for about 5 min. Salt and pepper lightly. 2. Next add the coriander and cinnamon and stir around to coat all the vegetables. When the spices start to stick to the bottom of the pot add the tomatoes and make sure to scrape the spices off the bottom of the pot. Next add the chicken and veggie stock (side note: you can use all chicken stock or all veggie stock, whatever you have) and bring the mixture to a boil. Salt and pepper lightly. 3. Add the Bulgar, turn stove to a simmer and cook with the lid on for about 10 min, check to see if the Bulgar is softened if not cook another 5 min. Taste the broth for salt and pepper, add more if needed. 4. Remove lid and add the fresh herbs, juice and zest of lemon and stir to combine. Turn the heat off and get ready to serve. I apologize for the funny turkey picture, my camera is on the fritz and I haven’t decided on a replacement yet. We are all so thankful for the bounty of leftovers that Thanksgiving brings, but then you look in the fridge and say “what am I going to do with all that turkey?”. Well try this turkey noodle soup that I found on my Whole Foods app. It’s a great way to use the leftover turkey as well as any leftover carrots, celery and greens. And if your lucky like me you can use some homemade turkey broth too. Enjoy! 1.Heat oil in a large pot over medium heat. Add garlic and onions and cook for 3 minutes. Add carrots and celery and cook another 5-7 minutes, until slightly softened. 2. Add thyme and stir to blend. Add broth, spinach, turkey, noodles, beans, and salt and pepper and stir well. 3. Bring to a boil, reduce heat cover and simmer about 15 minutes, or until noodles are tender. 4. Ladle into bowls and serve hot. When it comes to making lunch I start by taking inventory of my kitchen. 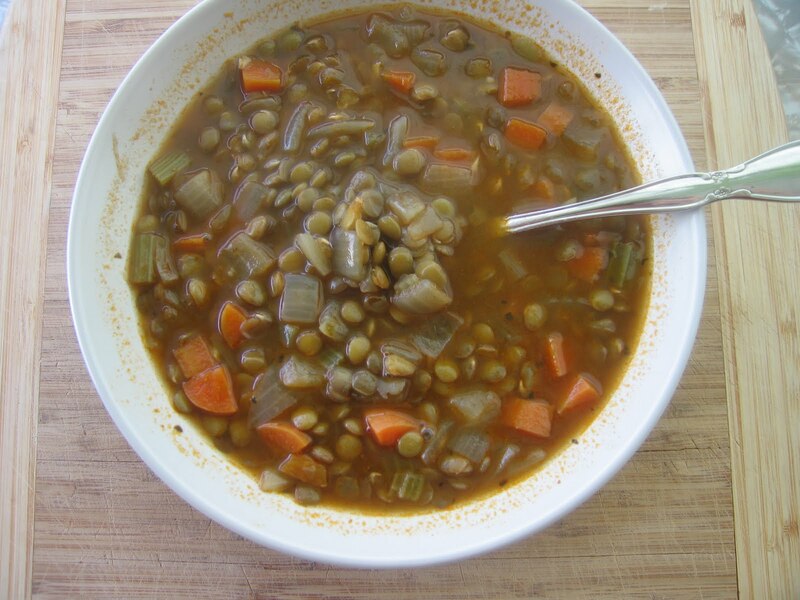 I always have lentils in my pantry as well as most the vegetables that are in this soup, carrots, celery, onions, garlic and potatoes. 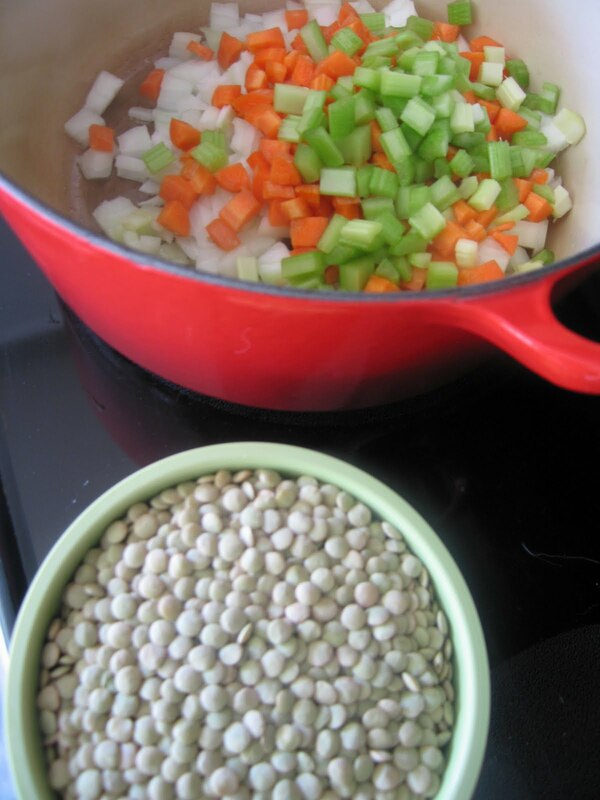 I also try to find a recipe that can be made in a big batch and can be portioned out for the entire week, this Lentil Stew is perfect! One thing I love about the fall and winter is being able to make big pots of soup, remember to make extra and freeze it for later. This recipe comes from one of my favorite cookbooks ‘The Kind Diet’ by Alicia Silverstone. 1. Combine the garlic powder, paprika, salt, cumin, oregano, and basil in a small bowl. Heat the oil in a large soup pot (you’ll be adding a lot of liquid later, so make sure it’s a big pot) over medium heat, and add garlic, onion, celery, carrot, and potato. Stir in half the spice mixture and the shoyu. Cook, stirring frequently for 7-10 minutes or until the onions are tender. 2. Add 5 cups of water (I only added 2 c), the broth, tomatoes and lentils. (I soaked my lentils overnight, drain and then add to soup) Bring to a boil over high heat, then reduce the heat and simmer with the lid askew for 30 minutes. Add the remaining spice mixture, and cook for 20 minutes longer or until the lentils are soft. Serve warm or portion out into containers for lunch. ENJOY! So know one wants to talk about the stomach flu or food poisoning but I’m suffering from one of them. I think last night was the first time I had eatin since Monday morning and I went for my cure all soup. I make this soup at least once a week, I make it when it’s cold outside, I make it when I have had way to much fun the night before and I most certainly make it when I’m not feeling well. I also call this soup Ramen Soup for Adults, which I made on Channel 2’s cooking segment “Monday Mom’s”. It just makes me feel good on the inside, it’s easy and you can add whatever you have in the kitchen. It’s a grown up version of Top Ramen and it’s good for the whole family. Enjoy! P.S. I’m going to give you the broth recipe which always stays the same and can be doubled over and over to feed everyone, and then I’ll share some things you can add to it to fit your needs and desires. 1. 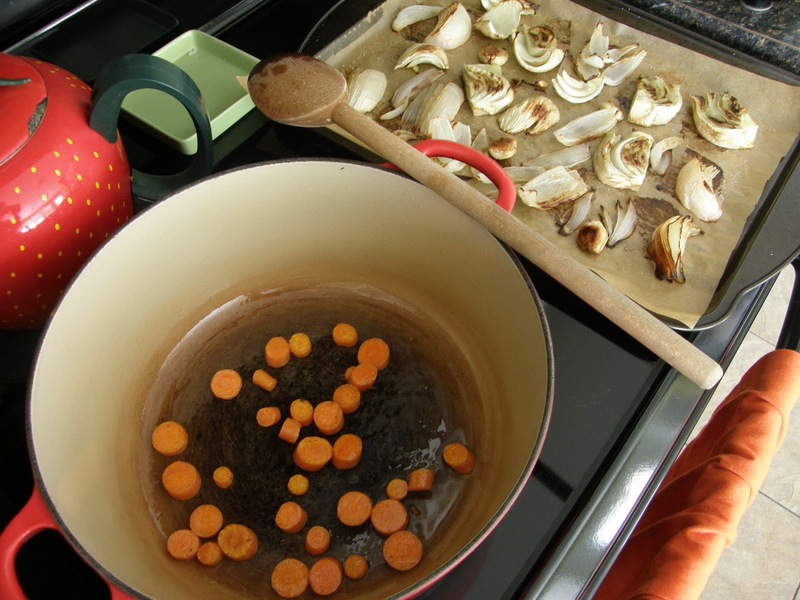 Start with a medium soup pot over medium heat add the vegetable broth, water, garlic, ginger, and kombu (if using carrots, mushrooms and bell peppers, saute them in the pot first to soften them then remove and reserve to add later). Bring to a boil, turn down and simmer for 20 minutes. 2. When the twenty minutes is up fish out the garlic, smash the garlic and add it back to the soup. Add the cooked veggies if using them, also this is a good time to add the edamame. Also add the liquid amino’s and mirin and simmer another 10 minutes. Before serving remove the ginger and kombu. This is where you would add the dissolve miso paste into the soup, make sure the heat on the oven is turned off. The heat kills all the good stuff in miso. Tip: If using noodles I cook them separate and put to the side. 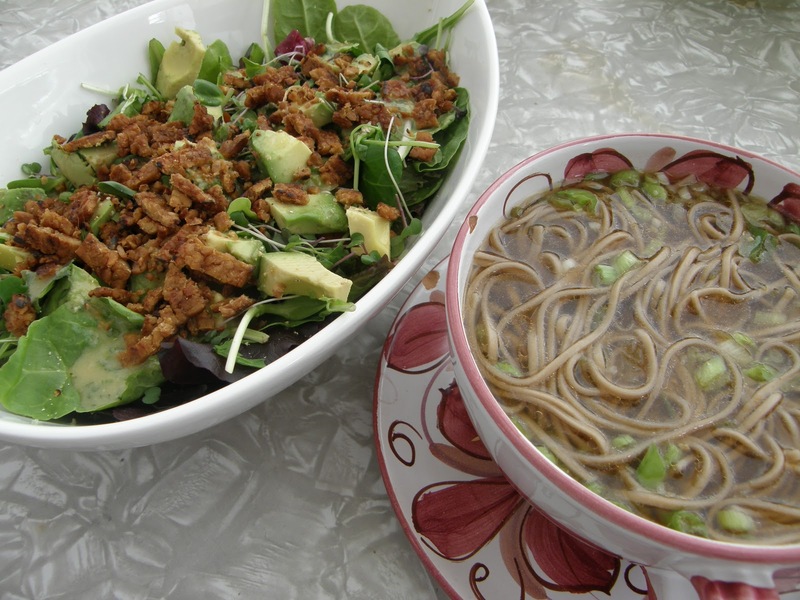 When I’m ready to serve I divide the noodles between the serving bowls and top with warm broth filled with veggies. Lately I’ve been using quinoa instead of noodles and I’ve been adding diced avocado. Make it your own, have fun. Miso: Is high in B12 and protein and rich in vitamins and minerals. Some experts suggest miso is a good source of Lactobacillus acidophilus (good for healthy gut).